Yes, it's true, I changed my blog name! For all those squinting and wondering who's showing up on the dashboard, I changed my name from "I Think I Just Screwed It Up" to "Sew Classic." 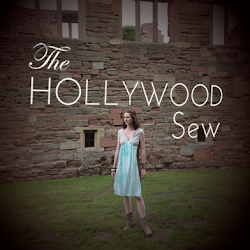 I felt like my old name was a little negative, not necessarily properly reflecting the crafting/sewing nature of the blog, and frankly, a little long and annoying to type into the address bar. So with that said, let's get right into this week's giveaway! 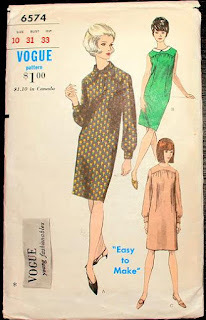 This is another old pattern from the 1960s that I find to be darling. The shift, option B, is perfect for summer and can easily be layered in the winter, though I do love the sleeves on the other dresses. And that Peter Pan collar is my favorite! Is anyone else incredibly jealous by the $1 price tag?! The pattern has been cut, but it's been properly cared for and all the pieces and instructions are there. It's Vogue 6574, size 16. Bust: 36" Hip: 38"
There are 4 ways to enter, additional entries/comments will be deleted. Two winners will be selected via random.org and the winner must respond within 48 hours or I'll select another winner. I'm opening this one up to other countries - so anyone from any country can enter! Contest ends August 8th at 11:59pm EST. How perfect that this happens to be my size. I love Peter pan collars on blouses. I would shorten View B to make a tunic to wear over jeans or a skirt (maybe belted). I love the new blog name. ...and I already follow your blog. I'd wear this swanky dress to work! I'd wear it out to dinner. i would wear it to work! I would make this for my daughter to wear to school. So cool!